One of the greatest food combinations is beets and goat cheese. 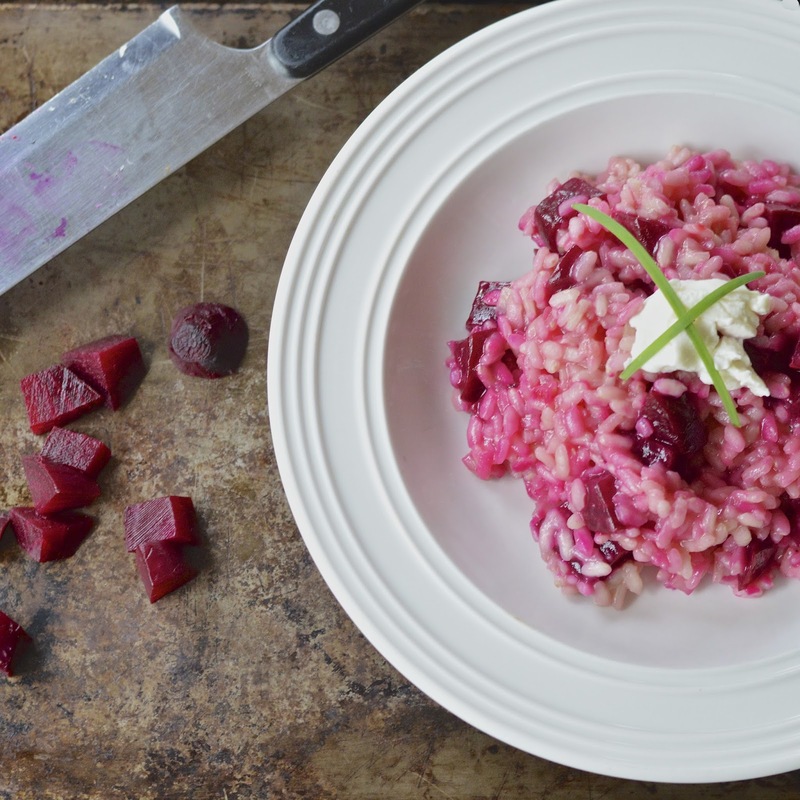 Therefore, this beet risotto with goat cheese recipe sings of food harmony heaven. The earthy sweetness of the beet compliments the tangy richness of the cheese. The creamy risotto ties it all together in the most amazing side dish or first course. My daughter loves risotto and had been begging me to make it for weeks (maybe even months). Sometimes she just gets completely annoyed and makes it herself (not bad for a 13 year old). 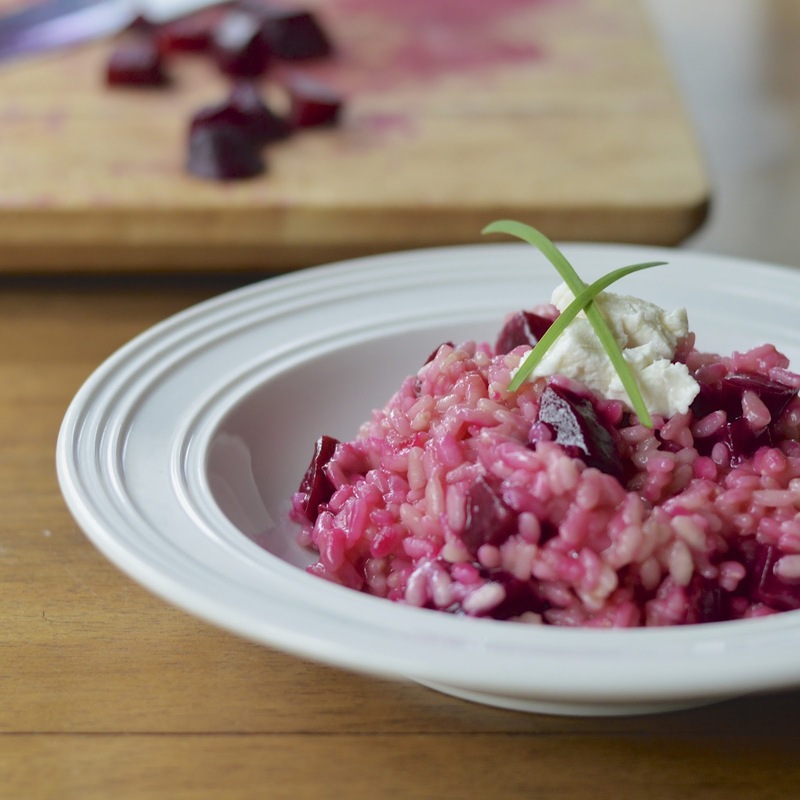 As well, my whole family is gaga over goat cheese, so this beet risotto was music to their ears. I know the thought of making risotto can be intimidating, but I assure you it’s quite easy. 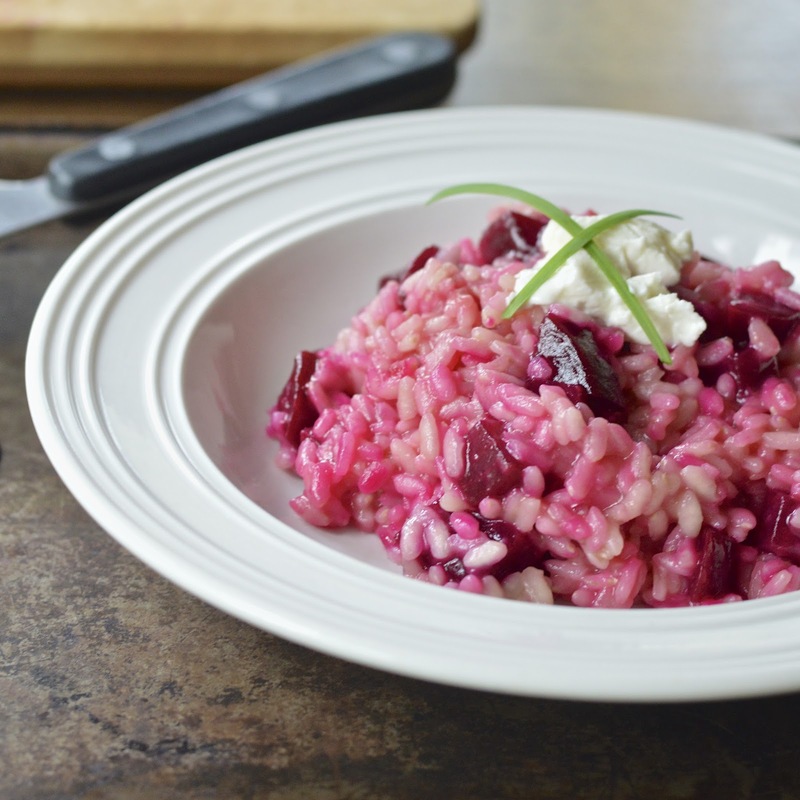 You just need a solid half hour to pour and stir over the stove top to create this traditional Italian rice dish. The beets and goat cheese are just frosting on the top. Pre heat oven to 400 degrees F. Wrap beets in foil and place on a baking sheet. Roast beets for 40 minutes. Remove from oven, let cool and peel beets with a paring knife. Dice into 1/2" cubes. In a medium saucepan, heat olive oil to medium high. Add shallots and cook for 5 minutes, stirring occasionally to be sure they don't brown. Add rice and stir to coat in oil. Reduce heat to medium and add 1/2 cup of stock and stir until most has been absorbed. Repeat with 1/2 cups until you have used all 3 cups of stock. Remove from heat and stir in butter and beets. Divide among four serving plates and place a 1 ounce dollop of goat cheese on each plate. Garnish with pepper and chives to taste. Carrots are beautiful! What a great blog. And yes I agree - more cheese the better.